In the second pAsuram, parAnguSa nAyaki says “In such state of mine, even krishNa is not coming, and due to being related to I who am a great sinner, oh heart! you too are not obedient towards me”. Subsequently, parAnguSa nAyaki says to her heart “krishNa who revealed his beautiful form and became obedient, is not coming; oh heart! you too are not obedient towards me, now who will save my life?”. The length night filled with darkness which is covering the deep ocean, the earth, the sky and which is having a well developed state and is very dense, extended without an end; krishNa who is having a complexion which matches neydhal flower and who is obedient to have such complexion as my wealth, have not come so far; oh heart of a sinner (me)! you are not favourable; when krishNa, the protector is not helping and you, the companion are not helping, who is the protector for my life? Avi kAppAr iniyAr – One who is supposed to help, has not helped; the heart too became unfavourable; now who is the protector/saviour? 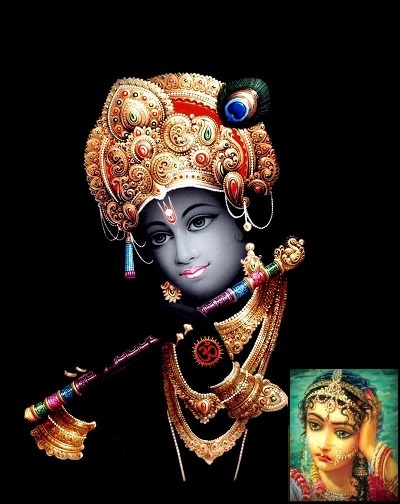 krishNa has not come, and oh heart! you too are not favourable – who will save my life? Azh kadal … – The objects which are pervading (i.e., the five great elements) are covered by one of those objects which is pervaded (thamas – darkness). The immeasurable ocean, the earth which supports all objects, the ether which gives space to earth – covering all of these. mA vikAramAy – (the darkness) Subsequently, not stopping with that, having great growth, appeared to be aiming to cover even the nithya vibhUthi (spiritual realm). It is attempting do what is done by the omnipotent emperumAn while manifesting the viSvarUpam (universal form). Or val iravAy – Since she is unable to have the intelligence to distinguish between the night and darkness, she is highlighting darkness as night. Or val iravAy – It is so densely dark that, even emperumAn sends his divine sudharSana chakra to cut the darkness, it cannot be broken. nINdadhAl – unable to see the end. kAvi sEr vaNNan – Having the complexion as explained in SrIvishNu purANam 5.3.8 “pullEndhIvarapathrApam” (one who is having the complexion of blossomed blue nelumbo flower). He is said to be having a divine form with dark complexion as in periya thiruvanthAdhi 26 “iruL anna mA mEni“. He can come like those who wear dark clothes to conceal their identity and comes. en kaNNan – One who came in the dark and helped, where kamsa had his evil assistants [waiting for him]. periya thirumozhi 7.5.1 “naL irutkaN vandha endhai perumAnAr” (my father and great lord who arrived in the midnight darkness). vArAnAl – Would it not be good if emperumAn who comes to destroy thAmasa prakruthi (demoniac persons), come and destroy thamas (darkness) itself? If he arrives, that will lead to her dawn at once. It is said in iraNdAm thiruvanthAdhi 81 “pagal kaNdEn nAraNanaik kaNdEn” (I saw the day (brightness) which implies seeing SrIman nArAyaNa). pAviyEn nenjamE – You too are similar to him. He did not help me not because of lacking the ability to help, but due to being related to me and being embraced by me – you too have both the qualifications [so you are also not going to help me]. nIyum pAngallaiyE – Though you both have some similarity, would it not be nice if you there were some differences [i.e., even if he did not help, at least you could help]? Should you who are naturally dependent behave like emperumAn who is independent but assume dependency [due to romantic mood]? If he gives up his romantic mood, he will be left with fully independent attitude only, but that is not the case for you [because you are naturally dependent]. When there are two obedient entities [emperumAn and the heart], if one [emperumAn] becomes disobedient, should the other entity [my heart] too become disobedient? Here, emperumAn and her heart are mentioned [and to be recited] in the same tone in “en kaNNanum vArAnAl” and “en nenjamE“. This entry was posted in thiruvAimozhi, thiruvAimozhi 5th centum on June 27, 2017 by Sarathy Thothathri.